Suppliers, distributors, and manufacturers commit significant resources to tracking and managing programs across hundreds of brands and product lines. Too much time is spent entering data, compiling reports, and making sure that the right information gets distributed to managers and sales reps on a timely basis. DI Program Advisor™ helps organisations manage programs, campaigns and other goal-oriented initiatives more profitably and efficiently by delivering key program metrics to all members of their sales & support teams on a daily basis. Built on The Diver Solution™, DI Program Advisor helps sales reps and decision & sales support staff gain self-service access to the information required to manage programs, promotions, incentives, placements and quotas. 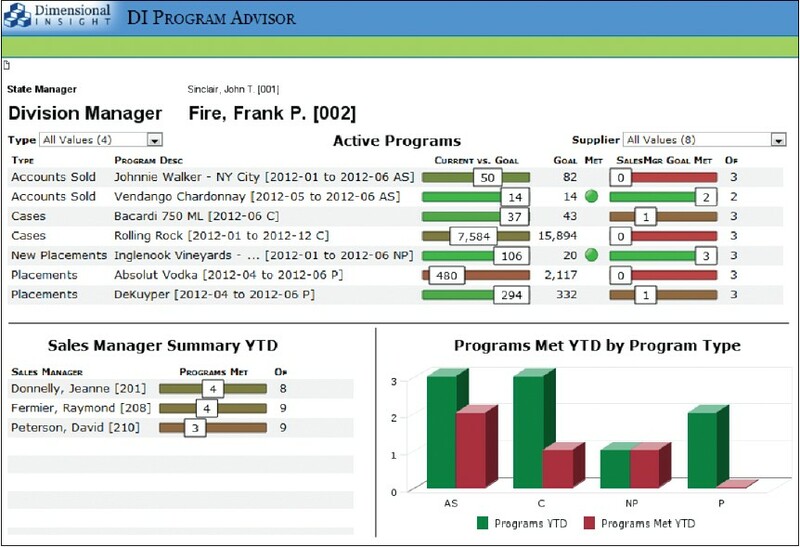 DI Program Advisor provides users with dashboard-delivered metrics that help them gauge progress against goals for any and all programs within their sphere of responsibility. Support for organizational hierarchies lets managers and directors see these metrics for all direct reports. sales. IT and sales support teams can maintain more programs with minimal additional investment in hardware or human resources. Design smarter programs and set more realistic goals & quotas based on historical patterns.